Touring with a pit orchestra is a career option for young musicians who opt for gaining travel and experience before settling down. Large national and international tours bring musical theatre to local audiences around the world. The pit orchestra is a key part of it all, along with the vocals, choreography, acting, extravagant set designs, and fantastic musical scores. Touring orchestras for musicals are usually reduced in size from where they were originally staged, due to the cost of traveling. As a result, the musicians are typically required to perform at a high level of artistry on a number of instruments (“doubling”), and are expected to cover as many parts of the full score as possible. Woodwind performers can be expected to be proficient on any number of combinations of instruments: flute, clarinet, saxophones, and occasionally double reeds. Brass performers can be expected to perform on trumpet, flugelhorn, trombone, tuba, and baritone. Typically, the orchestral reduction is created with specific performers in mind, which may result in several odd combinations of instruments. Having a firm grasp of fundamental musical skills is essential, with the goal of performing the most consistent show possible. Presenters all over the world are promised a certain quality of show when they purchase a production, so a commitment to accuracy is essential. A very specific combination of skills is required on the musical side of things, to help create the ideal consistent performance the production company desires. The musical theatre world, especially touring, places very high demands on its performers. It can be intolerant of fundamental errors. Also, the music supervisor may be unfamiliar with your abilities. Your first read-through of a piece may turn out to be your audition, and anyone not up to the required standard of performance will quickly be replaced. When a new performer is hired for a tour, there are often only a handful of music rehearsals before the show opens and goes on the road. Sometimes performers only see the music once before having to play in front of an audience. On an instrument with variable intonation (winds and strings), a firm grasp of just intonation and equal temperament is essential. Playing out of tune can cause strain on all performers, in the pit and on stage. When a show runs constantly, reducing even the slightest strain day-in and day-out can increase the endurance of all performers and prevent injury. Sounding as one cohesive unit means matching styles (articulations, dynamics, time feel, timbre, off-page interpretation). It also requires following section leaders and the conductor. The best ensembles match all of these skills to tie into the period of the story, ultimately making the show more cohesive. A contemporary addition to some shows is the use of a click track with the performance. This eliminates tempo deviations, and allows the orchestra to sync musical gestures with other aspects of the show such as lighting, videos, and other special effects. Playing to a click track can seem strange at first. But a familiarity with the practice is a new skill demanded by many shows. While many of us feel like the musical world should ideally be a meritocracy, where only the most talented performers rise to the top, the reality of the business is far from this scenario. With an ever-increasing number of talented performers graduating from music schools, emphasis has shifted to interpersonal skills – especially for touring productions. The unique scenario of traveling, eating, performing, and spending leisure time with those you work with is only found in a few industries. Maintaining relationships and having a good work life balance is necessary to prevent catastrophe backstage. Being kind to yourself and others makes you a person people enjoy working with on a regular basis. You may not like the people you work with, but there is no reason to make the environment toxic, which affects everyone. The work environment is not a place where you want to be subversive. Respectfully discussing any issue that comes up in the spirit of compromise is important. Maintaining a positive attitude keeps your ego in line. Receiving any criticism and taking direction well are important for continued work in the industry. Being on time is essential for any large-scale tour, because failure to do so causes things to no longer run on schedule. It can be as simple as showing up to the bus on time when you leave a city, or being ready for sound check at the same time every day. The schedule exists to put on a good show, and by not following it you disrespect the story you want to tell to the audience. Touring definitely presents its own unique challenges, but can be a very rewarding career. Many touring performers save considerable amounts of money while on the road. They avoid everyday expenses like rent, travel, and costs incurred when settled into one location. And after graduating, tours can be an excellent way to pay back student loans. 1. Ensembles were probably the most valuable classes for my role with “Dreamgirls.” Practicing music, reading, and running sectionals were very important to gain the experience necessary to play my role with confidence. 2. Course-wise, I wish that I’d taken lessons on my doubles, so that I’d have more formal training on those instruments. I also really wanted to take counterpoint, but always had full semesters. 3. Performing as much as possible was extremely helpful. Professional situations were valuable for learning the people skills necessary for touring. Playing in the 2011 Disneyland Resort All-American College Band was definitely an experience that helped in that regard. Hello! I’m a senior in high school currently playing both the flute and piccolo and have taking lessons for some time. I wouldn’t say that I’m a prodigy with my instrument, but I’m passionate about music and playing it. I’m looking into studying music education as I go into college. Is touring with a pit orchestra a possible option for me later on in the future? Or is studying music performance vital to being fit for a spot? — Thank you!! While we do know of music educators who also perform in pit orchestras, they must be highly skilled with expertise on more than one instrument in order to be considered. Who you know is also helpful! Whatever path you take, be sure to continue to hone your technical performance skills as well as sight-reading – pit orchestra members need to be quick studies because they often don’t have a lot of time to learn the music. I play saxophone(s), flute, percussion and double bass. Is this a useful combination of instruments? Will I ever double across sections? It depends on what the orchestra needs. The more proficient you are on more instruments, the better your chances. So much depends on who you know and how they get to know your level of proficiency. Do you have to major/minor in music to play in a pit orchestra or would playing in a college orchestra and keeping up practicing and your skills and technique enough? Also do you rely on sight reading as much as mentioned – I’m not the best at sight reading but I excel greatly at tone and musicianship. Last question, is competition for viola less than violin on broadway? You need to be a top notch performer who doubles on more than one instrument and has excellent sight-reading skills to get work in pit orchestras. There isn’t a lot of time to learn your part, so being a quick study with the music is essential. I’m a rising junior in high school I have played violin for 11 years and have played viola for 4 years. I am in a performing group and have traveled to China and Europe and many places in the states performing. I love broadway and the music they play. I don’t think viola is ever in Broadway’s pits is that correct? How should I prepare for this kind of stuff? I love performing it’s what I dream of doing. Take a look at Broadwaymusicians.com to see the instrumentation used in many recent and current Broadway shows. You will find viola in several of them. As the author of this article points out, however, you probably have a better chance of getting into a pit orchestra if you double on at least another instrument – in this case, violin. Hoi! I’m a freshmen in highschool and I’m a cellist, violinist, guitarist, and more (I have a very small life outside of instruments). Do pit orchestras often have cellists? Also is it a hard career to get into? Can you make a decent enough living off of it? Read all of the comments in addition to this article. You’ll learn more about the typical instrumentation in pit orchestras. Most pit orchestra players including the author of this article do other work in music such as composing, teaching, performing solo, in ensembles or bands – work that offers the flexibility that performers in pit orchestras need. I am a high school freshman and I play the bass clarinet at my high school as well as a local university’s symphonic band. I heard there is a high demand for bass clarinetists and while it is too soon for me to make a decision on my future, playing in an orchestra or pit is a dream for me. Is there a higher demand for bass clarinet than other instruments? Bret Pimentel has a great resource on his website which lists nearly every broadway show and the woodwind books on them: https://shows.bretpimentel.com/. Visit to see what is typically paired with bass clarinet on a musical theatre show. Often, bass clarinet is part of a standard “Low Reed” book, which would contain bass clarinet, baritone saxophone and bassoon. Bass clarinet appears much more often on books that have tenor saxophone and clarinet. Sometimes, in a reduced orchestration, there’s a clarinet-only book, with Eb clarinet, Bb clarinet and bass clarinet. The recent domestic tour of West Side Story, for example, used this type of orchestration. To begin, I’d recommend picking up the Bb clarinet, and start playing saxophone earlier rather than later. Bassoon isn’t as necessary but is useful. Be sure to read the comments in this article! Note that during intermission, performers often need time to take care of personal needs before giving their all to the second half of the show. Is it possible to get an associate conductor or conductor position without being an accompanist? I have conducted 12+ orchestra pits for many community theater productions and currently hold a choral director job at a high school. We’ve put your question to the author for his feedback. Stay tuned. Is it required for pianists to be proficient on multiple instruments? I’m a current high school sophomore. I’ve been playing piano for twelve years, I’ve completed all eleven levels of the MTAC Certificate of Merit, and I have perfect pitch. We spoke with Brett McDonald, author of this article, who happens to be in China performing in the orchestra for “My Fair Lady.” In his experience, keyboardists rarely double on another instrument, but they should have conducting experience because they are often serving as associate music director. He also said that those who work in pit orchestras as pianists have often entered the field from working as rehearsal pianists, as music director for community theatre shows, and as voice lesson accompanists. I play clarinet, violin and saxophone to grade 8 ABRSM level and flute to grade 6 ABRSM level. I am looking at music universities for next year, but was also considering a career in pits work after that. I was wondering if you thought this was a reasonable idea? And if so, how is the best way to achieve it? As you can see from the article, the more proficient a musician you are and the more instruments you play really well, the greater your chances of getting gigs in pit orchestras will be. Note that this is typically not full-time work, so you’ll need to fill in with other work as well. What are the chances of getting a spot in a professional pit orchestra if I play french horn (I would say horn because that is the proper term , but people are hardheaded), trombone, and trumpet? Due to financial limitations, pit orchestras have fewer positions but look more for those who can double. Being highly skilled on all three instruments puts you in a better position than if you were only proficient on one. But as the article indicates, proficiency on other brass instruments as well would serve you even better. Be sure to check out other comments on this article as well, for additional information. I am a sophomore in high school and a trumpet player for seven years. I am proficient and have a lot of experience but definitely not a prodigy and private lessons are not an option for me. I made into the pit orchestra this year and absolutely love it! How hard is it to get into a professional pit if you were to get a degree in performance or music ed? Look closely at the experience needed for this profession. Read the other comments as well. You’ll see that a combination of talent, experience, the ability to perform at a high level on more than one instrument, excellent sight-reading, networking, and interpersonal skills all contribute to getting a touring job. I have played keyboard for many community theater and high school musicals, but would like to explore playing (and possibly conducting) for professional groups. I have experience using the Keyboard Patch Solutions software on MTI shows. What is the best way to test the waters of working as a paid pit musician? See Brett McDonald’s response (he authored this article) to a similar question below. Hi! Thanks for the article. I was wondering, do pianists have any chance to be in a touring pit orchestra? Keyboards are commonly used in pit orchestras. Great question! We hope some folks who’ve worked in this capacity, like the author of this article, will respond. Like many gigs, it helps to get to know those already doing this. Experience is essential. The music business is still largely conducted by word of mouth, and it is nearly impossible to get work in the scene without having done similar work previously. Many people want to work the same tours, but those who know people in the business either from studying or working together will be called again and again to work. My best advice is to seek out opportunities to perform, in local musicals and other experiences too. The larger your network, the more likely you are to be connected to the work. Remember that your performance quality has to be above the competition in order for you to be asked. Currently I am a sophomore in high school, and have been playing the violin for approximately 9 years. Last year I played in my high school’s production of The Wizard of Oz, and we performed the exact Broadway production, therefore I tend to believe that I might be able to play at a Broadway level. Do you think this might be the case? What other kinds of requirements might there be? As the article points out, you must be a multi-instrumentalist, a very proficient performer on those instruments, and a very strong sight-reader to be a pit orchestra prospect. Hi! I’m a current high school alto saxophonist, and I’m also in theater, so one of my dreams is to play in either a touring or Broadway pit orchestra. That way I get a little both, theater, and band. I’ve been playing my alto for about seven years now, but I have also gone to clinics for bari sax. 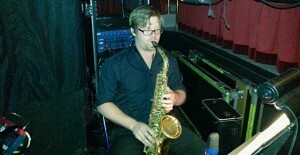 I also double on soprano sax for some songs my school plays. I also can play tenor, basically I’m very familiar with all four main saxophones. But I only own an alto and soprano. I’m currently in the tenth grade, and I want to major in music education and minor in composition for college. And I had a question on what should I do. I own an intermediate model alto sax. It sounds pretty okay, but I would need to move up to a professional model someday. You mentioned for pit you need to be able to double many woodwinds, and I’m aware of this. So should I start investing my money toward say a clarinet, and start working on my technique for it, or should I start investing for a professional model saxophone, and worry about the clarinet later. I feel like I should start investing on the professional saxophone model, but I wanted to hear your opinion, and what you did to learn the other instruments. Also, I would try to buy a cheaper clarinet, just to get a feel on it. I wouldn’t jump to a professional model yet. I’m currently a part of my state’s honor band for alto sax. Don’t know if that would change your opinion or not. You’re wise to be getting experience on all of the saxophones. If you major in music education with saxophone as your audition instrument, you may or may not need to take up the clarinet and flute as you would likely need to do if you were to become a performance major with saxophone as your main instrument. That said, the more versatile and flexible you are, the greater your chance of getting hired for a touring band. That includes being able and willing to perform a variety of genres of music. Ask your music teacher for their thoughts on whether your current alto is good enough to audition with. Typically the better the instrument, and the more experienced you are on that instrument, the better your sound will be. As for purchasing a clarinet, we think you have time for that. We suggest you focus on getting better on your main instrument through private lessons, practicing, performing, taking a summer music program, learning to play music of different genres, and taking time to enjoy your high school years. I agree with your comment of focusing on an main instrument through high school. Learning additional instruments becomes much easier and more manageable the more musical knowledge you acquire – but this knowledge is best learned through a primary instrument first. Examples of these skills and knowledge are: Music theory and notation, Harmony, Rhythm and applying those skills to your instrument through Etudes, Repertoire, scales and arpeggios. Learning these skills once allows you to quickly transfer this knowledge to a new instrument, allowing you to focus on the fundamentals of sound (which are the components of doubling that set you apart – sounding like a person who plays the instrument as their primary). I’m a firm believer that students tend to only be able to focus on one thing at a time, and it is wise to master one instrument before switching to others. You’re correct in thinking that the more flexible and adept you are at playing more than one instrument, the more marketable you are to a pit orchestra. Since you wouldn’t be traveling with a pit orchestra until you are out of school (note that depending on the caliber of the orchestra, you may need a master’s degree to be a strong candidate), we suggest you focus on honing your clarinet technique and learn to play various genres of music if that’s the instrument you think you will want to audition on in a few years. If you’re currently playing Bb clarinet, you may want to pick up the alto and bass clarinet at some point. There are crossovers among clarinet, saxophone, and flute, and many college music programs will expect you to perform on all three. That said, there are distinct differences that need to be taken into consideration as you learn these other instruments. Talk with your private teacher and band director for more suggestions, and consider summer music programs to enhance your playing and meet great music mentors and peers. I agree with everything in your comment. It is wise for Audrey to begin focusing on the instrument she wishes to pursue in college. The other woodwinds will come fairly easily after clarinet (The clarinet is the most difficult to build technique on), and trumpet and bass are not found in any clarinet book I know of. Books for woodwinds no longer cross over instrument families unless they are specifically written for a person who plays those instruments. Woodwind books tend to only contain flutes, single reeds (clarinet, saxophone) double reeds (oboe, bassoon, english horn) and ethnic woodwinds (tin whistles, pan pipes, ocarinas, etc). I am a percussionist at my high school and thought performing in the orchestral pit would be very neat. Where do you start? Is it hard to get a spot? What are all the requirements? – Thanks! An undergraduate performance degree is recommended. A master’s in performance may also be useful. Site-reading and the ability to perform at a high level on more than one instrument will be essential. Get experience by playing with the pit orchestra at your high school, at community musical theatre performances, and at your college-level music school. Learn how to work well as part of an ensemble, and be prepared for the load of music theory classes a music major needs to take by getting some music theory under your belt while still in high school. Summer music programs often offer music theory as well as the opportunity to play in the pit orchestra for summer musicals, so check out the 2015 Summer Music Camps & Programs on MajoringInMusic.com. Getting started in any musical career is mainly about experience. Undergraduate degrees are almost universally necessary to be at the performance level required by a pit orchestra. Meeting people who play in pits in town, getting experience playing local high school and college musicals and studying on the instruments required. It is impossible for anyone to get into the scene without knowing someone in it, and you are more likely to do so by playing some of the “dues paying” gigs, even as a substitute. Dear Brett, thanks, great insight, very informative article! 🙂 all the best!